Brno (Czech pronunciation: [ˈbr̩no] ( listen); German: Brünn; Laitin: Bruna; Yiddish: ברין‎, Brin) is the tradeetional caipital ceety o Moravie an the seicont lairgest ceety in the Czech Republic. 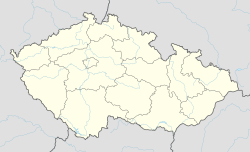 Brno is an aa admeenistrative centre o Sooth Moravian Region an Czech caipital o judicial authority. The population o the ceety is aboot 405,000 while the population o the greater metropolitan aurie is aboot 730,000. Brno lies at the confluence o the Svitava an Svratka rivers an it surroondit bi hills frae three sides, notable pairt o the aurie occupied bi the ceety is forest, aboot 28%. Average temperatur is 9.4°C an average Precipitation is aboot 505 mm (19.88 in). Brno is the seat o the Constitutional Court o the Czech Republic, the Supreme Court, the Supreme Admeenistrative Court, the Supreme Prosecutor's Office, an the Ombudsman. Brno is an aw an important centre o Czech heicher eddication, wi 26 faculties o 11 varsities an aboot 80,000 students. Brno is an aw the traditional place for performin big exhibitions an trade fairs on Brno exhibition centre. The ceety is an aw kent for hostin big motorbike an ither races on the Brno racin circuit an for an internaitional firewirk competition Ignis brunensis. Maist important main sichts o the ceety are ryal castle Špilberk an cathedral o saunts Peter an Paul. The ither castle in Brno is castle Veveri near Brno dam lake. Anither important monument o Brno is villa Tugendhat, which haes been includit in the UNESCO leet o Warld Heritage Steids. Ane o the attractive locations na anerlie for tourists is an aw the Moravian Karst. ↑ "History of the City of Brno - Statutory city of Brno" (in Czech). The Statutory city of Brno. Retrieved 6 September 2011. ↑ "Where in the world is Brno? - Statutory city of Brno" (in Czech). The Statutory city of Brno. Retrieved 6 September 2011. ↑ "Výsledky Sčítání lidu, domů a bytů 2011 podle krajů" (in Czech). Retrieved 19 March 2011. ↑ "Adresy v České republice: Brno" (in Czech). Ministry of the Interior of the Czech Republic. Retrieved 23 January 2011. Wikimedia Commons haes media relatit tae Brno. This page wis last eeditit on 10 Mairch 2018, at 19:55.